encantando platéias do mundo inteiro. Obs. : O título em português do filme acima, passou a ser "A Marcha dos Pingüins" (antes divulgado como "A Marcha do Imperador"). Este belíssimo filme acompanha a jornada de centenas de pingüins pela Antártida, percorrendo milhares de milhas de distância e enfrentando situações de grande perigo. O documentário francês A Marcha do Imperador, sobre a vida dos pingüins estreou há duas semanas nos Estados Unidos e vem conseguindo resultados excelentes: o documentário arrecadou neste fim de semana US$ 975 mil nas 64 salas onde está sendo exibido nos Estados Unidos e se é o filme que conseguiu a maior média por sala de cinema, superando os números não só de "Quarteto Fantástico", mas também de "Guerra dos Mundos". Crianças, idosos, casais e curiosos se deixaram levar pelo interesse em um documentário que na versão americana é narrado por Morgan Freeman que pode passar dos US$ 10 milhões em arrecadação quando ampliar sua exibição para cerca de 50 salas. Até o momento, esse valor só foi superado por três documentários: "Fahrenheit 11 de Setembro", "Super Size Me - A Dieta do Palhaço" e "Winged Migration". •E A C H W I N T E R, alone in the pitiless ice deserts of Antarctica, deep in the most inhospitable terrain on Earth, a truly remarkable journey takes place, as it has done for millenia. 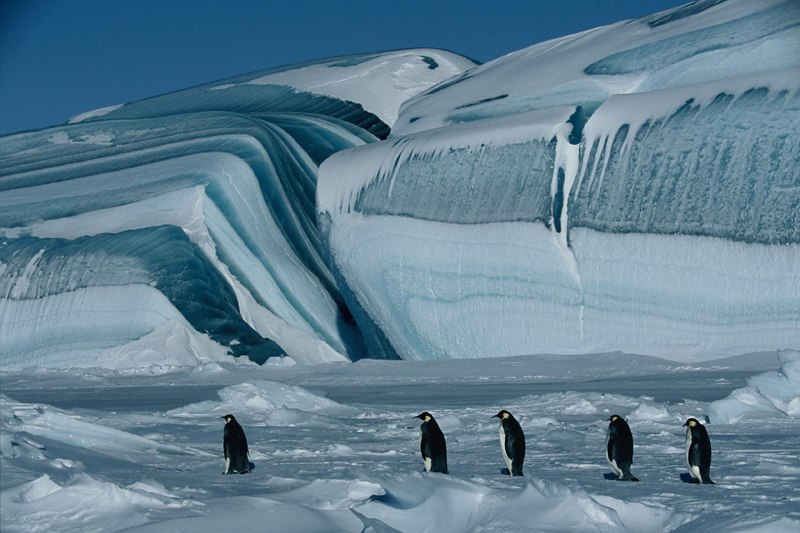 Emperor penguins in their thousands abandon the deep blue security of their ocean home and clamber onto the frozen land to begin their long journey to the continent’s desolate interior, a region so bleak, so extreme, it supports no other life. 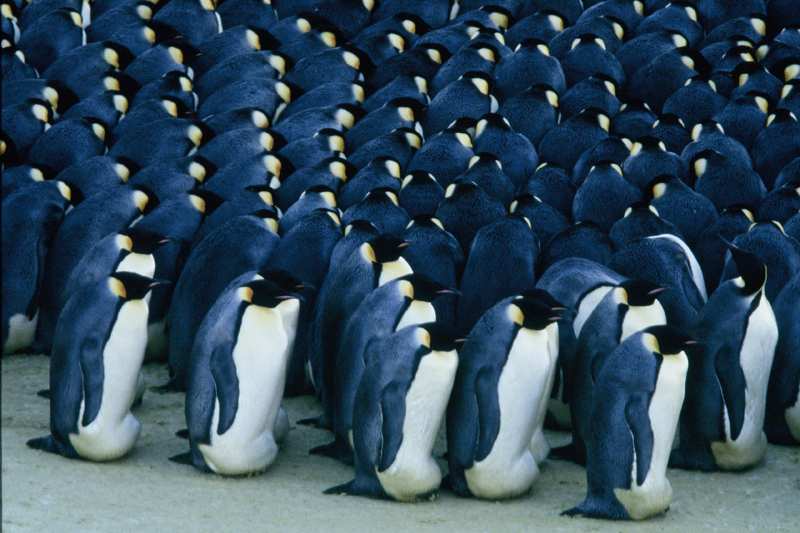 In single file the penguins march, blinded by blizzards, buffeted by 250 k.p.h. gales. Resolute, indomitable, driven by the overpowering urge to reproduce, to assure the survival of the species. •The days grow shorter, the weather ever more bitter. The females remain long enough only to lay. Once this is accomplished, exhausted by weeks without nourishment, they begin their return journey across 200 kilometres of ice-field to the fish-filled seas. The journey is hazardous, and rapacious sea leopards a predatory threat. The male emperors are left behind to guard and hatch the precious eggs, which they cradle at all times on their claws. Subjected to -40°C temperatures and the terrible trials of the polar winter, they too face great dangers. •After four long months during which the males eat nothing, the eggs begin to hatch. Once they have emerged into their ghostly white new world, the chicks can survive for only 48 hours on their own food reserves. If their mothers are late returning from the ocean with food, the newly-hatched young will die. •Once the families are reunited, the roles reverse, the mothers remaining with their new young while their mates head, exhausted and starved, for the sea, and food. While the adults fish, the chicks face the ever-present threat of attack by rapacious giant petrels. treacherous territory on Earth, until the chicks are ready to take their first faltering dive into the deep blue waters of the Antarctic ocean. •Standing proud on the ice frontier, the emperor embodies the most powerful moments of existence. Love and solidarity combine in the heroic struggle for life. •With short steps, bent under the pitiless burden of a driving snowstorm, the emperor penguin labours through a vast labyrinth of ice. Around him, all is white, all is in violent flux. Yet the valiant bird never falters, undaunted by seemingly insurmountable obstacles. He keeps going. In this land where no other creature ventures, the emperor continues on to his romantic rendezvous. As it follows the winter migration of the emperor penguin, "The Emperor’s Journey" tells a tale of legendary proportions, portraying the strange, spectacular destiny of powerful and emotionally-involving characters, rich in courage and humour, mystery and manifest drama. My goal is to dig from the ice a story which has never seen the light of day for want of a teller. A true story, however extraordinary. A story repeated every winter, as it has been for hundreds of thousands of years. But there has never been a generation of men to witness and shape it, to pass it down. For man has never colonised the Antarctic, this amazing ‘terra australis incognita’. The emperor penguin had never encountered man before the first polar explorers arrived barely a century ago. In 1950, when tentative, makeshift bases were established here, scientific observation had replaced legend as Man’s preferred narrative. The emperor penguin and man have not lived together long enough for folktales or myths to develop. 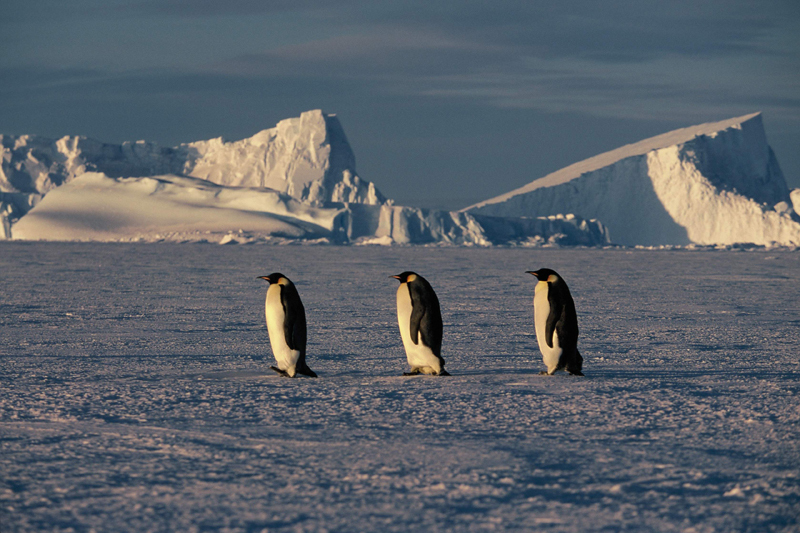 They remain strangers, crossing on rare occasions in the vast desert expanses of the Antarctic. With this in mind, my desire is to tell a real story: through the extraordinary images of the emperor penguin during the austral winter, images that have always fascinated me; and with words worthy of both the Antarctic’s excessive nature, and the emperor’s epic destiny. It is time for the emperor’s legend to be told. Prize-winning film maker, documentarist, cameraman and photographer Luc Jacquet is renowned for his nature and wildlife documentaries, which draw heavily on both his scientific background and his great talent for filmed narrative. "The Emperor’s Journey" is his first feature film. One of France’s leading documentary production companies, Bonne Pioche produces a varied slate of documentary films for all the major French channels and a wide range of international broadcasters. The company’s work been recognised with numerous awards at festivals world-wide, and enjoyed widespread international distribution. Bonne Pioche is also active in the production of TV advertising and music promos. Emilie Simon has released one album to date. Featuring contributions from sonic genius Markus Dravs (Bjork, Brian Eno) the eponymous release combines ethereal and haunting melodic pop songs with otherworldy and innovative soundscapes of great beauty. There has never before been a comprehensive feature-length film depicting the extraordinary struggles and triumphs of the emperor penguin. Our task was a mammoth one, requiring a full film crew to set up camp in the Antarctic during the winter and remain for thirteen months with no possibility of sea or air transportation. Thus stranded, our constant presence allowed us to capture the full and remarkable variety of penguin behaviour, as well as many bizarre and unique encounters. Of the 40 or so extant emperor colonies world-wide, only four are studied on anything like a regular basis. Only one is accessible without mounting an independent expedition: the Geological Headland Archipelago colony in Adelie, a few hundred metres from the French scientific centre of Dumont d’Urville. The centre provided the perfect base for our shoot, and our close relationship with the Institute for Polar Research guaranteed us effective, active cooperation. We are also deeply indebted to the support we received from the French Institute Paul-Emile Victor. Filmed in super 16mm to convey the full visual impact of this magnificent environment, "The Emperor’s Journey" includes underwater footage of the penguins’ winter activities, shot by experienced divers using specialized cameras and never previously captured in such breathtakingly beautiful detail.